ALIPAC calls on Amnesty Trump to end his "Trump Wall Pretense" now that it is clear he's using the issue to promote border destroying Amnesty for illegal immigrants. 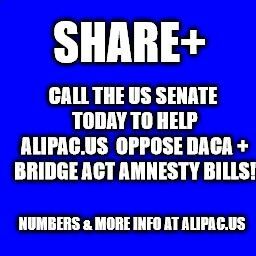 Today, the US Senate considers new Trump backed Amnesty legislation that would convert Obama's illegal and unconstitutional DACA Amnesty into a formal law designed to domino into Immigration Reform Amnesty for tens of millions of illegals, and ALIPAC's activists are calling Republican Senators to demand "no deals for DACA Amnesty!" 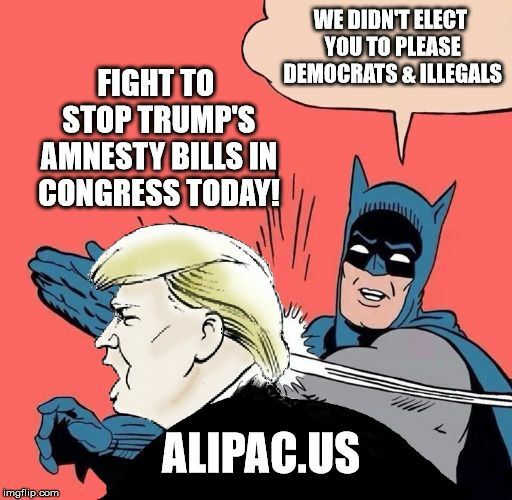 ALIPAC's grassroots activists have successfully fought and stopped similar nation destroying Amnesty legislation in DC since 2004 by using the truth combined with the power of American activists who oppose open borders. American border hawks who fought to stop similar Amnesty bills under Obama and Bush are now shocked and disappointed they must do the same under Trump. While originally supportive of a massive new wall on the southern border, ALIPAC is dropping support for Trump's wall efforts because he is only building fencing and he is only seeking a small fraction of funding needed for border structures in exchange for Amnesty for illegal immigrants which will render any borders and defenses moot. From this point forward, ALIPAC will refer the President as Amnesty Trump and to his deceptive bait and switch promises of a border wall as "Trump's Wall Pretense" now that President Trump is using the wall issue to advance DACA and Immigration Reform Amnesty for illegals. Trump promised during his campaign he would end DACA and oppose Amnesty, but today he says he wants to make DACA into a formal law to build trust to move on to Immigration Reform Amnesty in a "bigger deal" for millions of illegal immigrants in exchange for token border barrier funds. Trump also once called the Gang of Eight immigration bill Amnesty, but now he tweets he is open to "Amnesty" as a bigger deal. "We did not elect Trump to compromise with and seek to please Democrats and illegal aliens as he is today," declared William Gheen, President of ALIPAC. "By pursuing DACA, Amnesty Trump has made a liar of himself and fools out of all of us who voted for him due to his promises to end Amnesty, secure our borders, and send illegals home as our Constitution and current laws demand. We feel Trump should reopen the government and end the Trump Wall Pretense he is using to try to pass forms of Amnesty for illegal aliens." ALIPAC also feels that Trump's chances of reelection in 2020 are now very low because Trump will never be able to rally and mobilize millions of American voters, like those at ALIPAC, who responded to his campaign promises about border security and illegal immigration. ALIPAC is currently tracking ten important broken promises by Trump on immigration issues and unfortunately feels the Democrats and media are correct when they say nobody can trust Trump. Last edited by ALIPAC; 01-22-2019 at 01:51 PM. Another broken promise...Trump promised to put refugees in "Safe Zones" on their soil. Send them back! Defund the One Billion of our money given to Churches who bring them here and then we continue to pay the costs after they are brought here. Another broken promise...Trump vowed to enforce Public Charge. They are still on the taxpayer funded freebies. This is not being enforced. Sign an Executive Order to audit every tax refund to illegals, welfare, food stamps, Medicaid, school, disability, social security and taxpayer funded programs and terminate those illegal individuals now! hattiecat, gabelle39 and Againstallamnesty like this. "I will not warehouse thousands of illegal aliens in tents on our border". They why does he want 52 THOUSAND beds for them in this new "deal"? Process and deport within 48 hours and their UAC's. They do not qualify for asylum and have no proof. A "better life and a job" is not asylum. We want that here in our own inner-cities. Here it is ALIPAC activists! Your key to stopping the Trump Kushner sellout Amnesty in its tracks today!